AAA has backed out of their plan to move into the Jade Garden and UPS buildings in the Encina Grande shopping center on Ygnacio Valley Rd. in Walnut Creek, according to an email from the City of Walnut Creek. 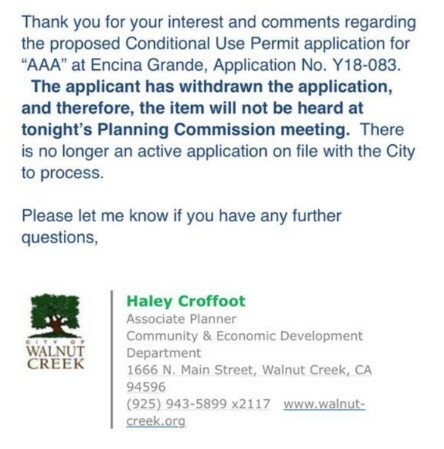 The Walnut Creek planning commission was set to discuss approving a use permit for AAA this evening, but they say AAA has withdrawn their application. This news comes just one day after we first reported that Jade Garden, a Chinese restaurant that’s been in the center since 1989, was told to leave by February of 2019 due to a restriction in the lease with Amazon-owned supermarket chain Whole Foods that limits the square-footage of restaurants in the center, according to the property manager, Recency Centers. Sources also told Claycord.com that Evie’s Hamburgers and Taco Bell have also been ordered to vacate the shopping center in 2019 due to the center’s lease agreement with Whole Foods. Ha! Okay that’s good!! Thank you. Oh gross you’re one of those people? Ewwww. Why oh why would you take it upon yourself to be THAT person and direct your opinion regarding corporate decisions on an employee? They are never involved in those big decisions and are just trying to do their job. Please take your entitled opinion somewhere else. You may have just ruined someone’s day with your negativity. Newsflash: a story has gone viral of a giant billionaire bullying a small business which created a HUGE public relations nightmare that cost Bezos millions in lost goodwill and forced Amazon to hire a damage control firm. Stopping going to gross corporation owned stores doesn’t matter to the employees, but if the number off customers drops enough, the company will care. The employees at the Whole Foods have no say over what is going on but the company that owns it, if their sales drop enough, they might think about not bullying smaller stores. Whole Foods already sells very sketch products which on multiple occasions have been brought under fire, like apricot seeds, that can literally kill people if consumed. If you want to make a difference, tell friends and family to stop shopping there. Educate on the truth, and stop giving them your money. If course you need to tell employees/mgrs. So they can push comments up the chain, letting them know less customers less money! Truth is, everyone is up in arms and vows to never shop there. Then they do. Then more people do. Then no one remembers they were even mad and life goes back to normal. I loathe Whole Foods and won’t shop at any of them. Ever. I think they are a vile corporation and this level of greed and destruction of family businesses everywhere they go is why. But until people actually are willing to do what’s uncomfortable to make it right, this will all blow over in a couple months and people will be saying “didn’t there used to be a Chinese restaurant in here at one point?” Shrug their shoulders and move on. Yes, you are so special and unique. And of course nobody else has the sheer will to turn their words into action. Thank god we have you here to point the finger at us sheep and guide us. What would we do without you, random anonymous internet user?! It seems like most people are incorrectly placing blame on Whole Foods. Whole Foods was courted to come to this shopping center after Safeway vacated and built an entirely new shopping center across the street. Regency Centers wanted Whole Foods, and WF told them what conditions would making putting a store there worth their while, including the square footage of competition they would be surrounded by. Regency AGREED to all of this. WF only laid out the terms they wanted, which any rational business developer would do. Another angle to this is: what would have happened if Regency failed to land a deal with WF? With Safeway building a brand-new center across the street, they HAD to land a new anchor store to keep the place alive and compete. So it is entirely possible they figured that it was either land Whole Foods (or something similar) or the shopping center would become irrelevant and hemorrhage money. So Whole Foods asked for the right to engage in corporate bullying and since Regency agreed there is no blame on Whole Foods? This is what any rational business developer would ask for? @Martha I’m against “corporate bullying “ too, it’s an inflamitory term and people are placing blame on only one of the corporations in his agreement. 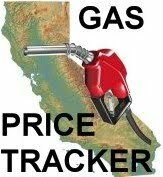 BOTH parties are responsible, and Regency is trying to weasel its way out of responsibility in the way it’s releasing info to the media. Last night KPIX news floated the idea that Rocco’s would be next to go. Whole Foods was approached with an opportunity, and said this is worth it for them as a business under these conditions. Then Regency agreed. It’s very simple. Whole Foods didn’t seek out Chinese restaurants they could destroy for fun. And for Regency to act like this is a surprise is complete nonsense. I’m not familiar with the term corporate bullying, but that sounds like a made up term. The more appropriate term would be market competition. And I am someone who would prefer to see Jade Garden stay and do not shop at Whole Foods. Curious, I wonder if the publicity did it. Calmly voicing your concerns to employees should not create a problem and you have every right to do that. You can also ask to speak to a manager whoes job it is to field those concerns. I don’t bother. I just stop shopping there. When their customer base dwindles I know why, but they still don’t. I wonder if this will change Regency Centers tune. They won’t be so willing to evict paying tenants if left with an empty property. Than you AAA for doing the right thing. I seldom have trouble parking there. The biggest problem to me is getting out of the lot. Ygnacio is like a racetrack, people block the driveways (not that it’s illegal, just rude) and trying to get out on Oak Grove isn’t much better, exacerbated by the mommy parade when school lets out. I guess what confuses me is driving away traffic as a long-term business strategy for this center. Corporate greed at its finest. I’m staying away from a Whole Foods for a long time. I am just stunned at the rude comments from the Whole Foods employees. Is that what their customer service is like? Regency and Whole Foods agreed to a contract. It’s up to Regency to enforce the terms of that contract-not Whole Foods. Regency is kicking out these businesses. Knowing that the terms of the contract would be unpopular with he community, Regency tried to amend the agreement even though they probably knew Whole Foods would stick with the original contract. Regency then “leaked” that amendment to the press to shift blame. I appreciate that the Mayor published the ammendment to the contract on Claycord earlier this week. But realize folks, that shopping center owners are the worst form of unscrupulous business people. Jennifer Hess – Regency Centers. I visited Jade Garden, not only do they have a good crowd but I’m hearing that at least for them the situation has changed and a lease has been renewed for another 2 years. Yay! STOP BULLYING the little guys. Your not any better than these scum lords that are out pricing tenants on there housing. Just read that Regency has Renewed Jade Gardens lease and are told that Evie’s and Taco Bell will be able to stay also. Also, did you all see that AAA backed out of the deal, hmmmm, makes you wonder why. I will not shop at Whole Foods anymore and I will not forget why. It really doesn’t matter to me if it was Whole Foods or Regency that came up with this idiotic condition in the lease. It just seems wrong that it was even agreed upon in the first place.